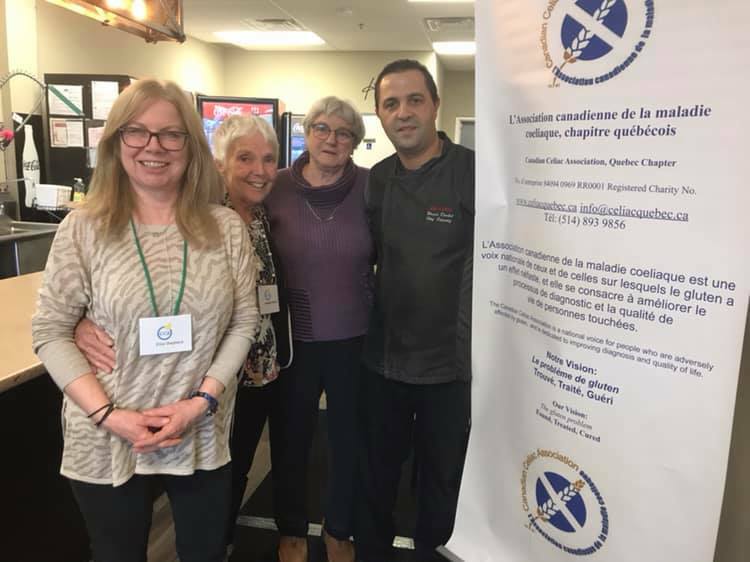 On March 16th we held a meet and greet with CCA volunteers at Allo Cuisto, a certified GF dedicated restaurant and caterer on the West Island of Montreal. The CCA Quebec Chapter Board encourages everyone to please support GF certified establishments, they are committed to providing safe gluten-free options. For info on the program check-out https://gf-verified.com/finder/ and find certified establishments across Canada. We had an absolutely delicious, guaranteed gluten-free, meal for a very reasonable price. Quality and price are well worth giving Allo Cuisto a try! They also have two wonderful services - catering and take out. If you are having a conference or meeting and need guaranteed gluten-free food give Wajihe Chef a call and see what can be arranged. They also have 5 meals for a set price that you can take out and freeze or use right away. While you are there take a look around as they also sell some interesting GF products, including frozen desserts and croissants. Chef Wajihe is a wonderful person who is enthusiastic and dedicated to bring safe, gluten free food to those who need it.